Taylor McMurtry and Just An Illusion on course in Sunday's $50,000 EMO Grand Prix, presented by Pfizer Animal Health. 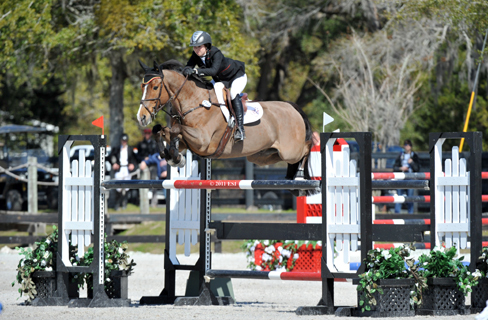 OCALA, FL (February 15, 2011)-- It wasn't just an illusion when Taylor McMurtry and her own Just An Illusion won Sunday's $50,000 EMO Grand Prix, presented by Pfizer Animal Health. 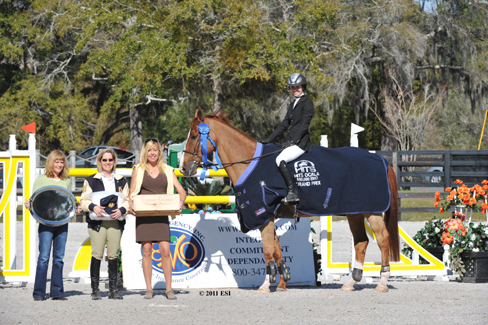 The horse-and-rider combination celebrated their first Grand Prix win ever to conclude the Ocala Winter Classic. "I'm so happy!" exclaimed McMurtry, 18, who found her way to the top on a beautiful sunny day at HITS Post Time Farm. "I'm overwhelmed. Especially since it was my goal to win a Grand Prix this year, I am so excited that I did and so early in the season!" McMurtry of Barrington Hills, Illinois and Just An Illusion enjoyed a successful run last winter at HITS Ocala with multiple ribbons in the Grand Prix and qualified for the Pfizer $1 Million Grand Prix, which is once again on their radar. "We had such a great time showing in the Pfizer Million in Saugerties last year," she said. "I really hope we qualify again as it is definitely a big goal of mine." Thirty-Four riders took the field on Sunday to navigate the first-round course set by International Course Designer Bernardo Cabral of Lisbon, Portugal. The course proved difficult, especially in the home stretch. As riders made their way to fence 10 which was a vertical, it required a tight rollback to an oxer at fence 11. This led to the last line which was a triple combination to a vertical with a Liverpool. The end of the course caused the most grief, as 11 had the last fence down. McMurtry's trainer, Grand Prix legend Aaron Vale of Morriston, Florida and Paparazzi 10, owned by Thinkslikeahorse and Norman Petersen, led off the class. They had a rail down at the B element of the triple and at the last fence, for a total of eight jumping faults. "It was good to watch him [Vale] go first," said McMurtry. "It was a tricky course and it rode a little different than it walked. That last fence seemed to be at a funny angle and I did it in a steady seven, though most people did it in six." The dominant team of Tracy Magness and Mr. and Mrs. John Bartko's Tarco Van Ter Moude showed fifth in the order and made their presence felt as the first pair to go clean. The victors of Wednesday's $2,500 Brook Ledge Open Welcome, Magness and Tarco, as he's often called, are a consistent winning combination at HITS Ocala, and tough to beat in the clutch. McMurtry would join Magness four trips later with a clear ride of her own to set up the jump-off. Another Illinois native, Laura Linback [Mundelein, Illinois] steered Woodrun's Uppsala to a clear round three trips later, and Harold Chopping of Southern Pines, North Carolina aboard Penelope Straight and Jenna Hoy's Little Glen's Valentino completed a clear round of their own four trips after Linback. The next 11 failed to make it around the course clear, as rails down in the triple and at the last fence seemed troublesome for many. Twenty eighth to go was Mickie Sage of Denver, Colorado and Katie Shannon's Ultimo, who broke the unlucky streak with a clear round and joined the group moving on to the jump-off. After another string of riders failing to go clear in the first round, all eyes turned to the final entry of the class, German Grand Prix rider Andre Thieme and Seth Vallhonrat's Coco 135. Thieme added another threat to capturing the win when he finished with all fences intact. At the end of the first round, the six teams advancing to the jump-off featured a mix of young, up-and-coming riders combined with a solid group of seasoned veterans, all looking to take home the first-place purse. Cabral's short course featured eight obstacles and a time allowed of 57 seconds. The track finished at the same last jump that posed trouble for so many in the first round. Magness and Tarco Van Ter Moude were the first to jump-off and set the Great American Time to Beat at 42.223 seconds with no jumping faults. The team would ultimately finish in second place. McMurtry and Just An Illusion had a mountain to climb next as Magness and Tarco Van Ter Moude are consistently fast in the jump-off and set a tough time to beat. They rose to the occasion and shaved nearly a second off the time and took over the lead in 41.439 seconds. Next to show was Linback aboard Uppsala who posted the third double-clear effort in a row when they timed in at 42.849 seconds, which finished in third. Chopping and Little Glen's Valentino returned next, and finished with four jumping faults in 41.927 seconds, which ultimately placed them sixth. Sage and Ultimo delivered a clear jump-off round in 44.148 seconds to ultimately finish fourth. Last to show in the jump-off was Thieme and Coco 135, who were second in Thursday's $25,000 SmartPak Grand Prix, presented by Pfizer Animal Health. The team had the fastest time by more than a second but in a heartbreaking finale, the last fence came down adding four jumping faults that put them in fifth place and crowned McMurtry the winner. "Ocala is home for him [Just An Illusion]," said McMurtry. "He loves coming out for the big Sunday classes. We just have such a great connection together and he gives me a lot of confidence for the bigger classes." With the win, McMurtry currently has $15,000 in prize money and two of the eight Grand Prix needed to become eligible to for the 2011 Pfizer Million. With 10 more opportunities to compete in qualifying Grand Prix at HITS Ocala, McMurtry will have plenty of chances to make her goal of qualifying for this year's Pfizer Million a reality! Kathy Stringer of Great American Insurance, President of EMO Sue Bopp, and HITS' Account Executive Corporate Sponsorship Lisa Engel presented the awards to Taylor McMurtry and Just An Illusion. McMurtry's parents received a bottle of chardonnay courtesy of Sonoma-Cutrer Wines. The Ocala Winter Festival begins this week and will be highlighted by the $25,000 SmartPak Grand Prix, presented by Pfizer Animal Health, on Thursday, February 17, the $50,000 HITS Grand Prix, presented by Pfizer Animal Health, and $10,000 Devoucoux Hunter Prix on Sunday, February 20. All Grand Prix and Devoucoux Hunter Prix events this season are qualifiers for the 2011 Pfizer $1 Million Grand Prix and inaugural Diamond Mills $500,000 3'3" Hunter Prix Final, respectively, which will take place September 10-11 at HITS-on-the-Hudson in Saugerties, New York. For more information on the HITS Ocala Winter Circuit, or to request a prize list, please visit HitsShows.com or call 845.246.8833.